I seem to be a day behind again! What's up with that? Some cosmic force is holding my heels down. 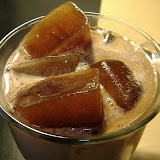 Yesterday was Chocolate Mousse Day. In belated honor, here's a recipe for Decadent Chocolate Mousse that sounds like it could kill the hardiest of choco-holics. 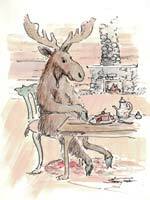 And if you're a chocolate (not-limited-to-mousse) fan, you might want to mark your calendars for October 14, 2006, the 4th Annual Chocolate Moose Festival at the The Murie Center in Moose, WY. A bit far for me to go, but it sounds like fun. And the entries all sound delicious and decadent. Too bad they don't include photos on their website. Catching up to today . . . Martin Luther King was assinated on this day in 1968. I remember that day. I remember thinking I didn't want to live in a world where such evil things happen. As a little bit of trivia, Muddy Waters got his nickname - not from coffee, like you might think - but from his grandmother chiding him for playing in the muddy banks of the Mississippi river. However, when I was searching for info on the man, I found a ton - I mean a TON - of coffee shops all over the U.S. called "Muddy Waters", and one coffee roaster, which apparently is defunct because their website is gone. I sort of thought there might be a connection, coffee shops, blues, muddy ... well, you get the picture, but there seems to be no connection at all that I could find. And I could only find one song recorded by Muddy Waters that had anything to do with coffee: Iodine In My Coffee, from the album Top of the Boogaloo. I'm still trying to find an mp3 of it. Kat? Anybody? Bueller? LOL, Cin, please if you do try it, come back and let us know how it was. Hope you don't go into a choco-coma! Well, you may be a day late, but I managed to miss this post completely! The recipe sounds gorgeous, so I'm adding it to my "try" collection. Heh, I wondered if anybody else would remember Ferris. So, I went ahead and ordered the CD of that song. Will post it when I get it!